"The first time I ever met Dan he was as young SID at Northwestern State University,” said Bruce Brown, the former longtime sports editor at The Daily Advertiser in Lafayette. “USL was playing there in football, but NSU was in a transition at their facility. There was no real press box. It was more like a tree house and they had this torrential rain and raging wind, and he was trying to run around and do everything and help everyone. McDonald’s career took root when he was still a teenager growing up in the timber country of north Louisiana, where he worked for both his hometown’s weekly newspaper (The Jackson Independent) and local radio station (KTOC-AM) in Jonesboro. While in high school, he handled scoring, public address and posted weekly statistics and stories in the Jackson Independent for the local youth baseball league. After graduating from Jonesboro-Hodge High School in 1972, McDonald went on to study at Northwestern State. He honed his craft working as a student assistant under former SID Pesky Hill, writing and editing for the student newspaper, The Current Sauce, and helping launch NSU’s first radio station, KNSU, now known as KNWD. When iconic musician Jim Croce perished in a plane crash after a concert on campus, McDonald’s coverage was picked up by Rolling Stone, among others. After graduating in three years, McDonald joined the sports department at The (Alexandria) Town Talk in 1975 and worked under legendary sports editor Bill Carter, who himself received the DSA honor in 1988. Hill had departed to take the same position at Oklahoma State, so NSU reached out to McDonald to return as the school’s SID at the ripe age of 21, making him the youngest SID at any Division I program. Despite his youth, it didn’t take long for McDonald to make his mark, as he won a couple of national awards for brochures from CoSIDA. “If God created a better sports information director than Dan, then he must have kept him himself,” said 2015 DSA recipient Glenn Quebedeaux, then the sports editor of the Daily Iberian in New Iberia. Added Walker, "When he was the SID, his commitment to detail was as about as complete as anybody I’ve ever known. Every single ‘I’ was dotted and every ‘T’ was always crossed. He was always very precise with his details. McDonald’s lasting impact resides in the legion of former assistants and student assistants who have gone on to become prominent figures and leaders in collegiate and professional sports. A few of those notables are Herb Vincent, associate commissioner of the Southeastern Conference; Greg Sharko, media relations director for the Association of Tennis Professionals (ATP); Pat Murphy, Hall of Fame softball coach at the University of Alabama; Christopher Lakos, associate SID at University of Georgia; Joe Lynch, executive director of alumni relations at Gettysburg College (Pa.); and Doug Ireland, longtime SID at NSU and chairman of the Louisiana Sports Hall of Fame. "One of his biggest joys is enjoying the success of others," Walker said. "With Dan it is never about Dan. When somebody that might have worked for him, and they have personal or professional success, that truly pleases him more than his own successes. This is an ego-driven business and you just don't find people like him." “He is the current-day father of SIDs in the state of Louisiana,” said Jeff Conrad, who served as a student assistant and general assistant under McDonald. “There are other excellent SIDs that have worked longer at their schools, but nobody can top the lineage, the tree and branches that he has. “When he left it was overwhelming,” said Conrad, who is now director of communications at the University of Houston. “I remember we were coming back from Sun Belt Conference Media Day and we were in his car. Just out of curiosity I asked him if he had ever thought about leaving, and he said, “Well, that’s kind of funny that you mentioned that.’ It was overwhelming because those were tremendous shoes to fill. McDonald joined the sports department of The (Lafayette) Daily Advertiser and quickly ascended among the state’s best writers. He captured 31 LSWA writing awards in his nine years at the paper, including three “Writer of the Year” honors in a five-year span. He also received a national “Best of Gannett” award for his coverage of the 2005 Little League World Series in Williamsport, Pennsylvania. McDonald left The Daily Advertiser in 2008 and became vice-president of McD Media Inc., a marketing and public relations firm founded by his wife, Mary Beth, also an NSU graduate. 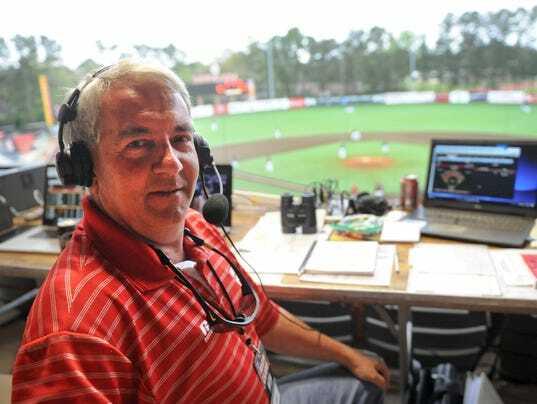 In addition to his role with McD Media, McDonald works as a freelance sports journalist, including earning his fourth LSWA Sports Writer of the Year honor in 2011, and doing extensive broadcast and television work, including anchoring annual webcasts of Sun Belt Conference baseball, softball and golf tournaments. In addition, McDonald has served as media relations director for the Web.com Tour’s Chitimacha Louisiana open, chairman of the Bill Bass Open fundraiser tournament for the Ragin' Cajuns golf team, co-chairman for LHSAA state high school golf tournaments held in Acadiana, served as vice president and president of the LSWA, and remains a key member of both the LSWA Executive Committee and Hall of Fame Committee. “I always trusted Dan and he guided me through that. They got me straightened out and got me on the right track. That crisis was averted because of Dan.